Rounds 16-23: Repeat rounds 12-15 twice. Chain 4, join with a slipstitch in first chain to form a ring. Ch 90, work tr, dc, tr, ch 3, slipstitch in the fourth chain from hook. *Chain 3, tr, dc, tr, ch 3, slip stitch in ring. Repeat from * once. 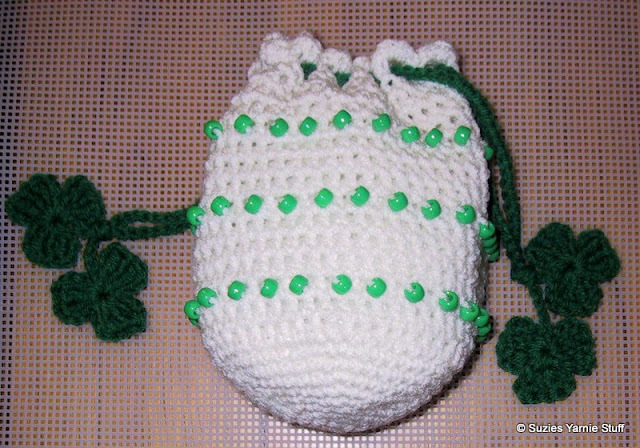 Fasten off and using tapestry needle run tails under base of the stitches and tighten hole in center of shamrock..
That is adorable!! Love the beads on it! I really like this little bag ..It's cute..thanks for sharing. I just luv Suzies Stuff patterns and have used many of them. Go girl go!